Tiger Gaming Poker Review – TigerGaming $2500 Bonus! Visit Tiger Poker Get Your Bonus! Fully licensed and regulated. Licensed in Curaçao ... regulated and certified safe by the Curaçau eGaming Licensing Authority. Super-fast withdrawals within 24 hours, backed by guarantee ? 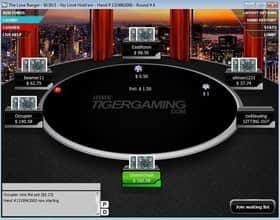 All legitimate, real-money poker sites like Tiger Gaming Poker have strict anti-fraud screens, and that may create a short withdrawal delay. Make your first deposit and Tiger Gaming Poker will match it 100% up to $2500. What are you waiting for join today! ? Please read the terms and conditions of the bonus carefully. If you are relatively new to poker or you know your skills are not the greatest, wouldn't it be nice to find an online poker room where you can relax, have fun, and try to win a few bucks without the sharks attacking you from every direction? If that describes you, Tiger Gaming Poker is the perfect place to play online. 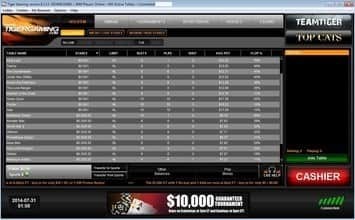 Depending on your bankroll and what stakes you feel most comfortable playing for, you can select a table with limits as low as .01/.02 or as high as $5/$10. And to welcome you to the site, all new players start off with an exceptionally generous bonus that matches your opening deposit 100% up to $2,500. Of course, you need to be certain that you are playing on a reputable site, where your money is safe and secure, you are treated fairly, and you are paid promptly. At TigerGaming Poker you never have a problem in that regard. Tigergaming.com has been operating successfully online since 1999, back when online gambling was just getting started. So you know you are dealing with a fair and reputable company. Another really cool thing about Tiger Poker is all the tournaments and special promotions. So you are guaranteed never to be bored on this site. There is even an adjoining casino, so if you would like to take a break from poker and play one of the casino games, you can. Tiger Gaming Poker is one of the best online poker rooms you’ll find specifically catering to casual and recreational players. If you are a skilled player wishing to play for high stakes or at least in games where the level of competition is comparable, you should look for another site. But if friendly, affordable poker in a non-intimidating atmosphere is what you are seeking, look no further. Many players just starting out make the big mistake of being too impatient to win as much as possible as soon as possible. So they get in over their head playing for higher stakes than they should and against players that are way out of their league. Tiger Gaming Poker is a site where you can start slow, if you need to it, then pick up the action and play for higher stakes when you are ready. Tiger Gaming Poker has been around for a very long time, since 1999 in fact, so it is no newcomer to the online gambling scene. Meanwhile, lots of new online poker rooms keep popping up, but without an established track record, so you never really know whether the site is going to deliver on its promises and treat its players fairly. With Tiger Gaming, you do know because there is no way the company could have stayed in business as long as it has if it were not running a legitimate operation and its customers weren't satisfied. Tiger Gaming Poker is part of the Chico Poker Network. The company is owned and operated by Action Commerce, Ltd. and licensed in Curacao. Tiger Gaming Poker welcomes players from many countries, but unfortunately, no U.S. players are accepted. Unlike many, if not most, online poker rooms today, the only way to access Tiger Poker is by downloading the software. There does not appear to be an instant play flash version or a means to play on mobile devices. This means in effect that you can only play on your own home computer. With today’s busy lifestyle, an increasing number of players greatly appreciate the tremendous convenience of being able to take their iPad, iPhone, or smartphone with them and have ready access to the games at any time no matter where they are. Hopefully, TigerPoker will correct this serious deficiency soon and release an app for both Apple iOS and Android devices. Meanwhile, the good news is that downloading the Tiger Gaming software is a quick and easy process that should take just a few minutes. The website is also very user friendly and easy-to-navigate. The Tiger Gaming software offers a couple of really cool features. The first is that you take notes on other players at your table. You can also set up a Buddy List, so you can play with your friends. And if you need to review the game basics before you start playing, there is a place on the website for that, too. Poker sites were once notorious for not giving their new players much of a bonus when they signed up, and sometimes no bonus at all. Today that trend has changed, and at least some online poker rooms, and Tiger Gaming is definitely one of them, are now offering poker players a sign-up bonus comparable in amount to what is typically given to slot players. The Tiger Gaming Poker Bonus is a very generous 100% match of your opening deposit up to $2,500. Keep in mind that you don’t have to deposit the maximum. As long as you deposit at least $50, you will receive the full 100% bonus. Naturally, the bigger your bonus, the more play you will have to show before it becomes available to you for withdrawal. The bonus is exclusively for players who have never made a previous deposit on the Chico Poker Network. The 100% up to $2,500 Welcome Bonus is permanently available to all new depositors, from all countries. TigerGaming Poker uses a system called Player Option Points (POP) both for clearing the bonus and rewarding your play. For every $1 contributed to the rake in a real money cash game or paid in tournament poker fees, you are awarded 10 POP points. In order to clear the bonus, for every $1 deposited, you need to earn 18 POP points. Players are given 30 days to clear the bonus in full. 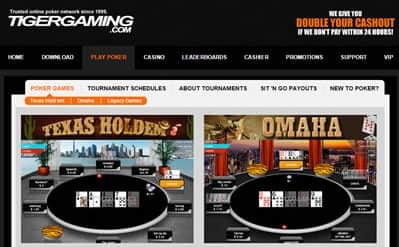 Banking at Tiger Gaming Poker is fast, easy, and reliable with a wide choice of deposit options (see list at the beginning of this review), most of which can also be used for withdrawal. All of your financial transactions are fully protected, and, unlike many other sites, Tiger Gaming prides itself on super-fast withdrawals. All withdrawals are processed within 24 hours, backed by a guarantee of double the amount and the next cash out free of charge. This is not a site where you are ever waiting for weeks wondering if and when you will receive your money. Note that you are allowed one free withdrawal per month. Otherwise, you are charged a small fee. The Tiger Gaming Poker ring games include No Limit, Limit, and Pot Limit Hold 'em and Omaha and Omaha Hi Lo. Hold 'em games range from .01/.02 to $5/$10. Omaha games range from .05/.10 to $1.50/$3. In addition, several old time games, including 7 Card Stud, Panguingue, Chinese Poker, Big 2, and Guts are offered in the "Legendary Games category." However, these games are only available on old software. The current software does not support them. This reviewer was surprised to see 7 Card Stud placed in this category and feels it does not belong there. Admittedly, this traditional form of poker is nowhere near as popular as hold ’em nowadays, especially with young people, but it is still being played, and many poker rooms still offer it. It is also frequently included as a tournament format. One sure way to render this game obsolete is to stop offering it. Instead, it should be more actively promoted. A site like this should at least offer it at low stakes (i.e., $1-$5) as an alternative to hold 'em. On the other hand, if you like to mix up your poker with other casino games, the Tiger Gaming Online Casino gives you lots of options. The casino is perfect for when you want to take a break from poker and try another game. You can choose from slots, video poker, blackjack, American and European roulette, baccarat, keno, Caribbean Stud, Pai Gow, 3 Card Poker, and Red Dog. Also, what will work very much in your favor as a poker player is that many people, who are primarily casino game players rather than poker players, will be switching over at times to the poker part of the site. More often than not, they will be poor poker players who will be easy to beat. Tiger Gaming Poker also has plenty of daily tournament action, so you are never at a loss for something to do. The biggest weekly tournament is the $10,000 Guaranteed Tournament taking place on Saturday at 7 p.m. ET and Sunday at 6 p.m. ET. The buy-in is $20 + 2. You receive $2,000 in starting chips, with rebuys allowed in the first hour and an add-on of 5,000 in chips at the first break. The top 30 finishers share in the prize pool. There are more guaranteed tournaments with smaller prize pools taking place during the week, one every day in fact. For half the price of the weekend tournaments, you can try your luck in the $5,000 Guaranteed Tournament taking place Wednesday and Thursday at 8:30 p.m. ET. The buy-in is just $10 + $1, with 1,500 in chips to start, and the same rebuy and add-on terms as the bigger tournament. However, only the top 15 finishers share in the prize pool. There is also a $2,000 Guaranteed Tournament every Monday at 6 p.m. ET and every Thursday at 7 p.m. ET, costing only $8 + .80 (or free with a $30 deposit) where players get 1,000 in starting chips, unlimited rebuys in the first hour and one add-on of 3,000 chips at the first break. Tuesday at 6 p.m. ET is Turbo Tournament time. This is also a $2,000 guaranteed tournament, but the buy-in is only $1 + .10. The starting stack is the same 1,000 in chips, with rebuys and one add- on, but with lightning fast blinds. It should be noted that while only the Tuesday tournament is classified as a Turbo, all of them are fast tournaments where luck, not skill, is the main factor in whether or not you wind up in the money. However, playing in them is fun, the price is right, and you never know, you just might score a big win. By the way, it is mentioned on the website that you can use your "promo bucks" rather than real money as buy-ins. However, it is not explained what these promo bucks are and how to earn them. Players who do well in the tournaments and play in a lot of them have a chance to make more money. Every three months three new leaderboards are created based on tournament buy-in. 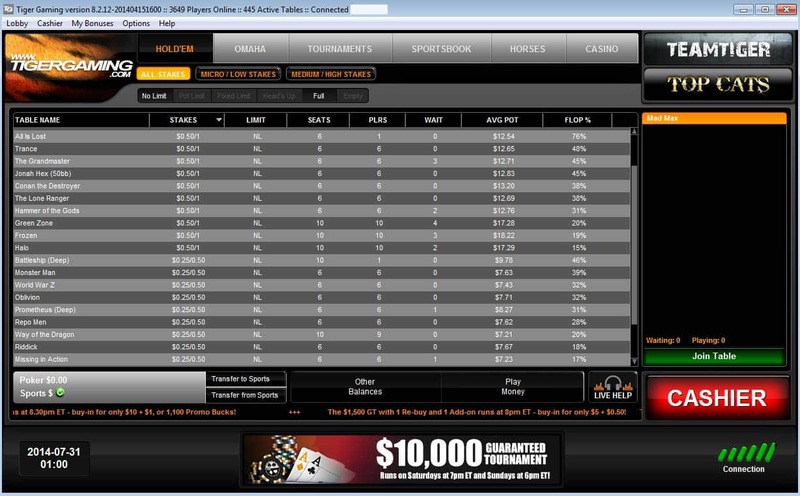 Then the top 100 players in each category face off each month in a freeroll, where the top 30 share in the prize pool. The Bronze level leaderboard is for tournaments with buy-ins of .05 to .99, the Silver level leaderboard is for tournaments with buy-ins of $1 to $9.99, and the Gold leaderboard is for tournaments with buy-ins of $9.99 and up. The freeroll face-off prize pool is $500, $1,000, and $2,000, respectively. Besides all of the multi-table tournaments (MTTs), Tiger Gaming Poker has lots of Sit and Go (single table) tournaments, and there are leaderboards for those as well. For example, Tiger Gaming Poker is closing out the year 2019 with a "December Leaderboard $50,000 Extreme Sit 'n Go Challenge." You can try to grab your share of $50,000 cash playing in Sit and Go tournaments. See the website for details. Also, be sure to check the website often to learn about any special tournaments that may be coming up. For example, Tiger Poker holds a special $25,000 Carnival Guaranteed Tournament. What a way to start the New Year if you can win one of the top prizes in that event. The buy-in is $75 + $7.50, or a $150 deposit. There are also many other ways to qualify for a seat. See the website for full details. Then daily qualifiers are being held for another $25,000 Guaranteed Tournament taking place. One lucky player will win a trip to the Quebec Winter Carnival (or the equivalent in cash) and those who finish in 2nd through 10th place will also win cash. Tiger Gaming poker players are rewarded for their play in real money games by earning POP points. (See website for details.) When enough points are accumulated, they can be redeemed for cash. There does not appear to be tiered loyalty level program, which will deter higher level players. However, in addition to the leaderboards already mentioned, there is another one for the top 200 players who qualify for "Team Tiger" status. These players receive special bonuses and invitations to exclusive freerolls. Even if you don’t make the top 200 list, there are always lots of special offers and fun promotions open to all players. Here are some of them. Payers can opt in for the Bronze Boodle (75% deposit match), Silver Slinger (100% deposit match), Gold Finger (150% deposit match), or Platinum Plus (200% match). The first two bonuses require a deposit of $25 to $500, while the 150% bonus requires a deposit of $50 to $1,000, and the 200% deposit requires a deposit of $100 to $2,500. The required play to clear the bonus also increases for each higher level of bonus. See the website for the complete terms and conditions. For each friend you refer who signs up and as a real money player, you receive a cash bonus, and your friend gets free tournament entries. All you need to do to qualify is lose with a jack high flush or better in a hold 'em ring game. The size of the jackpot depends on what stakes table you are playing at. Don’t expect a huge jackpot, though. It will be a minimum of $10 at a .10/.25 table up to $50 at a $5/$10 table, and $100 at a higher limit table. Customer Support via live chat or email is offered 24/7 to address any questions or concerns you may have. There is no phone support. Join Tiger Poker today and get your deposit matched up to $2500!